There’s a fascinating book that I would half-recommend: Running With the Fairies: Towards a Transpersonal Anthropology of Religion by Dennis Gaffin. 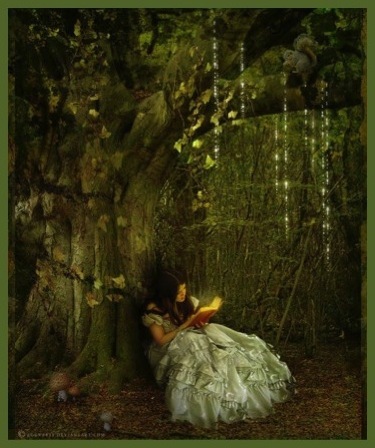 The first half of the book worked quite well for me, but I didn’t think the latter half of personal testimonies from people who believe they are reincarnated fairies or actual fairies in human bodies quite jelled. I support people believing whatever they like—and it harm none—but I had a problem with their adamant insistence that there is no such thing as a dark side to the fairies. All is sweetness and light in their Universe. Which flies in the face of millennia of human folklore and experience which sees the fairies as a tricksy lot, often inimical to humanity. The believers in this book put that down to superstition and ignorance, but I’m not so certain. People in past centuries may have been superstitious and ignorant, but in general were no more clever or no more stupid then we are. And they had a much vaster experience of the dark side of nature than most of us do these days. It’s easier to discount that chthonic world when you have electric lights and indoor plumbing. If there are such things as fairies, there may indeed be good ones, but I suspect most are at best ambivalent towards humans, and some may actually be malevolent. But anyway, Dennis Gaffin. He’s an academic (a Professor of Anthropology at the State University of New York College at Buffalo) who has done something quite rare: a serious study of contemporary Irish fairy belief. Academics are big on doing serious studies of the folk traditions of Buddhists or South Seas Islanders or Native Americans, et al., but there’s a prejudice against turning that same eye towards Western folk beliefs. It’s an inherently racist stand, I think, that Those People and their Quaint Beliefs are okay to study, but somehow Western belief structures must be dismissed as silly trash. It’s as if the people who are doing the studies have decided that First Worlders are “too good” to have such ideas, that they must be ruthlessly derided and suppressed by Western academia so we can preserve our collective First World reputation. So Professor Gaffin runs an academic risk here. True, he’s an anthropologist who’s gone native, so to speak, and now perceives fairies his own self. Which further risks his academic reputation, I suppose, but his point of view straddling both worlds is fascinating to me. I feel a kinship to him. Have I ever seen a fairy? No. Nor heard none, neither. Do I believe in fairies? That’s a thorny question. I believe in another world that cozies up to this one and sometimes leaks through. I suspect that Whatever takes many forms and some people—otherwise rational and solid citizens—see It as fairies. Bigfoot, Loch Ness Monster, devas, dakinis, djinn, angels, name your poison. It’s all part of the same bag: That Which Leaks Through. It’s okay. I know you think I’m crazy. When I say I don’t care, I don’t mean it in a snotty or rebellious way. I mean that I made a conscious decision some time ago to share the things of the spirit as they come to me, in case someone else is having similar experiences and wondering if they’re nuts. I can’t answer the question of sanity, but I do know that I am a rational person who occasionally has trans-rational experiences. When it comes to belief, experience is the core of it, an emotional heart-to-heart with something beyond the narrow confines of personal ego. It’s not a received wisdom, which is why religion often fails to convince. “Belief cannot be transferred,” says Professor Gaffin, “for it is a function of experience.” These things often seem to go hand-in-hand with a closeness to nature. As we move more and more away from the natural world and more into a mechanized, urbanized environment those experiences become more rare. Scientific education is a great thing and a fundamentally good way of looking at the world. I highly recommend it. But even scientists (well, the rational ones) will admit they don’t have all the answers. There was a time when I was about ninety percent of the way towards atheist. I called myself agnostic, but I’d come to view the Universe as fairly mechanistic. At one point, I finally said, “Okay, I don’t believe there’s anything else.” The Universe decided to call my bet. Almost as soon as I’d uttered that sentence It sent me an extraordinary experience. Followed by another and another until I capitulated, swept up in what to me was irrefutable evidence of there being something else. Generally, I’ve been a great deal happier in my “defeat” than I was in my “victorious” skepticism. Why me? Why was I sent experiential data? I haven’t a clue. That’s the thing about the Universe. It’s a big freaking mystery with big freaking mysterious ways. We wander down half-formed pathways with thick fog on either side and every once in a while the mists lift to reveal a dazzling view of sheer cliffs and the dramatic crashing of waves far below. 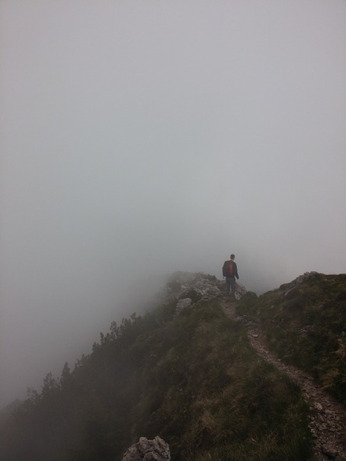 Then the clouds return and we proceed on the path—but once you’ve seen it, you can’t un-see that amazing sight. You’ve glimpsed the beauty and the peril lying just beyond the verge. You step carefully from that point on. There’s always one in every crowd. You know, you’ve got a good thing going and that one guy or gal pushes things too far and ruins it for everyone. This is no less true when dealing with fairies. I was reading R. Macdonald Robertson’s Selected Highland Folktales and he told the story of “The Fairies of Pennygown.” If any of the townsfolk of Pennygown needed help with a task, they brought the work of an evening to a certain nearby sithean, a lovely green fairy hill. By morning, the task would be nicely completed: spinning, weaving, repair, mending, you name it. One villager, though, kept leaving more and more difficult things, pushing it. One night he left by their hillock a piece of driftwood which he had picked up on the sea-shore, with instructions that it was to be made into a ship’s mast. When the villagers came next morning to collect the property left overnight, they found none of the tasks executed. This last request had angered the fairies so much that they had left their hillock, in disgust, for good. Any reasonable being would be put out by such oafish behavior, it’s true. But it’s also true that helpful fairies are a tricky lot. They can have goodwill towards humans, but it can also turn on a dime. If they’re insulted, they can get mischievous and mean. Some say poltergeists are fairies who’ve become insulted by a householder and take it out in spite. They also have sometimes exacting standards of what constitutes insult. Brownies and hobs, for instance, will gladly help out with the housework, usually at night like the Pennygown folk. However, they don’t want to be seen, and don’t want payment, or even expressions of gratitude. They will, though, accept gifts, mostly in the form of food, especially porridge and honey. If a householder starts taking them for granted, openly thanks them, or considers the food “payment”—or if they try to get a glimpse of them—the brownies will forthwith abandon the house, never to be seen again or lend their help. There are other European versions of such beings: tomte in Scandanavia, domovoi in Slavic countries, Heinzelmännchen in Germany, Haltija in Finland, many others. Some have even made the trip over the Atlantic to the Americas. 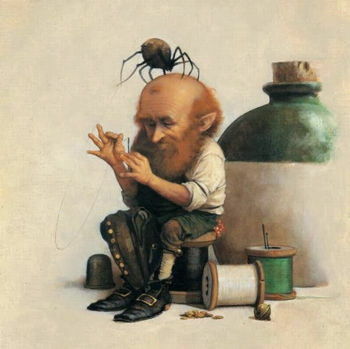 But in my (admittedly limited) investigation of helpful fairy folk, I’ve only found one non-European example of work-helpful fairies, the koro-pok-guru of the Ainu people of the Northern Japanese islands. These beings would hunt and fish for the Ainu in exchange for little gifts, leaving the goods overnight. Like the brownies, they hated being seen. Of course, one Ainu loser couldn’t leave well enough alone and blew the gig for everyone. The young man in question waited by the place where the gifts were left, determined to see a koro-pok-guru, and laid hands on the first one to appear. It was a beautiful koro-pok-guru maiden, but she and her people were so angered at this affrontery that they disappeared, never to help the Ainu or be seen again. Very strong parallels with the European myths, but that isn’t entirely surprising. Ainu are racially distinct from the Japanese. Recent research suggests Okhotsk origins and there is still a small population of Ainu in Russia. They share that pan-European ancestry, so they share those ancient pan-European stories. But as I said, I haven’t found anything else like it around the world. Good and bad spirits aplenty, but none who will pitch in to do the work for humans in exchange for small gifts. I am far from an expert on this, so if anyone knows of such a tradition in a non-European context, I would love to hear about it. This is CGI, but one of the best of its kind I’ve seen. The payoff is definitely worth the watching. 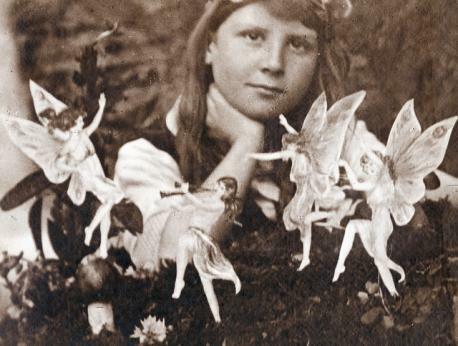 Is there anyone who is a fan of folklore that hasn’t heard of the Cottingley Fairies, for good or ill? There may be a few, I suppose. I’ll give a brief explanation, by way of introducing a very charming film taken from The BBC Roadshow, featuring Frances Griffiths’s daughter and granddaughter. Basically, two girls named Frances Griffith and Elsie Wright came home one day in 1917 and told their parents Frances had seen fairies by the brook near their village of Cottingley in Yorkshire. Their parents mocked them, which made them mad, so they set about creating photographic proof. They were so determined to come up with this proof that they cut out pictures of fairies from Edwardian books, mounted them on cardboard, and artfully arranged them in the foliage near the brook so they could interact with them. Everyone was amazed. The local theosophists got ahold of the story and ran with it, then the spiritualists, then (and this is what really condemned the girls to a life of lying) the great spiritualist himself, Sir Arthur Conan Doyle, who went so far as to write a book on the subject. Do I believe in fairies? Certainly not in cardboard cut out ones. A modern eye isn’t as easily fooled, I don’t think, as Edwardians. (But that could just be early 21st century hubris talking.) We look at these photos and think, “How could anyone be fooled by them?” But people wanted to believe, and in that time when photography was new, many accepted that the camera could not lie—and believed. Do I believe Frances saw fairies that first day and that childish righteous indignation at being mocked for the truth led her and Elsie to a twisted path of lies? I believe anything is possible, especially lies hiding a truth, and truths hiding a lie. I believe in the will to believe and the will to persuade. I believe that things unseen are not so easily reproduced upon command and the temptation to give nature a helping hand is sometimes overwhelming. I believe that is almost as tricksy an answer as the Cottingley Fairies themselves, who are often obstreperous and contrary creatures. And so, the film. I love the little girl in pink standing next to the “expert appraiser.” Her expressions and body language are priceless, swinging between boredom and interest. A child of a different time than Frances and Elsie, to be sure, but no less fascinated. I was into a goddess phase for awhile. Empowerment, all that jazz. My personal belief structure has broadened since then, become (I hope) more nuanced and more inclusive. I no longer feel the need to make it a goddess vs. god universe. I like to joke that I worship the Holy Hermaphrodite, but that ain’t much of a joke. We’re all part of the same creation, yin and yang. We need to cut each other some slack. I acquired this statue of Freya during that goddess phase, but mostly I wanted it because of that face. Who could resist it? She has such an open and serene expression that it makes me happy just to look at her. Surrounded by her gigantic necklace, Brísingamen, her hands folded meekly, you’d never know she was such a kickass female—a war goddess. That appealed to me, too, at the time. It still does to a certain extent, but what also appeals to me about Freya are her other associations with love and fertility, and her personal longing for love. Her husband, Odr, was frequently absent, you see, and she cried huge tears of red gold for him. Which proves yet again that no matter how strong and powerful we are, we can still be laid low by love. If we’re lucky. The capacity to love is a blessing. Being laid low by it is a symptom of how open our hearts are. I was looking hard for love when I acquired this statue of Freya, a perpetual search back then. She resided in my bedroom in my old apartment, standing atop a cabinet my father made for me to hold my huge collection of earrings. Given her Brísingamen, it seemed an appropriate place for her. Am I still looking for love? Not in the same way I was back then. I am not so particular about the kind of love I receive, not looking only for a mate. Love of any kind is a blessing, and the fires that drove me to find a partner are banked low these days. I wouldn’t turn it down if it came my way, but I don’t feel the need to seek it. Things change. Fires of all kinds renew. Phoenixes rise from ashes, and so might my quest, but mostly I’m glad not to be consumed with it anymore. I’m pretty much a Jungian about such things. The journey within, self-knowledge, is the true goal, the true gold. That’s our only shot at understanding anything truly meaningful about the universe. I believe there is a Higher Something, but our human minds can’t comprehend it. All godhead is the same but because we are fragmented creatures we come up with a multiplicity of aspects to portray that godhead. All paths lead back to the same source, and we can’t approach it with externals, but sometimes there are very nice things that help us see an aspect of that Something. Some years after buying the Freya statue I decided that my mythic world might be a little unbalanced and (since my pocketbook was not as challenged) I also acquired Freyr, Freya’s brother and lover. Very phallic, but that’s probably food for another post. Freya seemed much happier having him around and so was I. We please our goddesses as we please ourselves. I have lost touch with many aspects of my sacred journey, my mystical journey into the dark heart of myself and out the other side into the light. 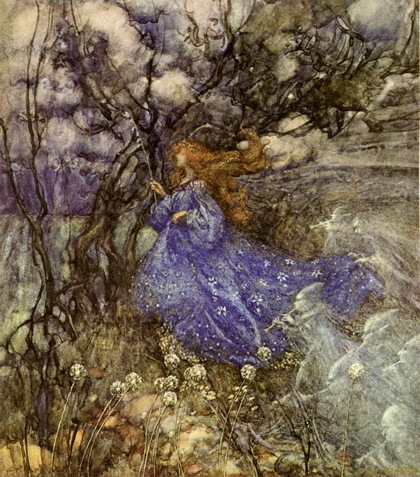 It’s a fairy journey, into and out again. I hope to return to that rediscovered country, to see what else it can show me, and to settle myself in the now instead of the hoped-for future and much-regretted past. 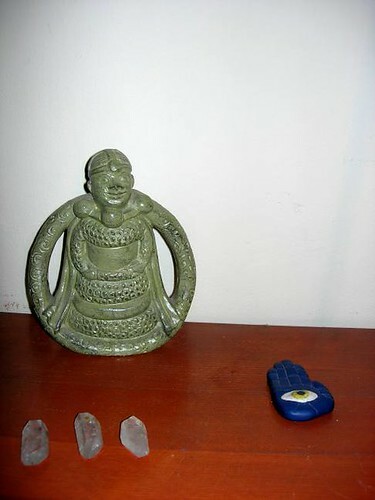 These things in my room are merely touchstones, aspects of a more profound reality inside my own heart and soul. Looking at them fresh again, remembering why they were important in the first place, is part of the journey back to that forgotten land. Renewal waits around the next turn in the road. *Inspired by Xavier de Maistre’s book of the same name, I will be journeying around my sitting room/writing room as the mood strikes me and reflecting on the larger life meanings of the things I find there. The things themselves are not important—they are just objects—but hopefully those remembrances and reflections will be of interest. Another irregular series that I will probably keep up with . . . irregularly. 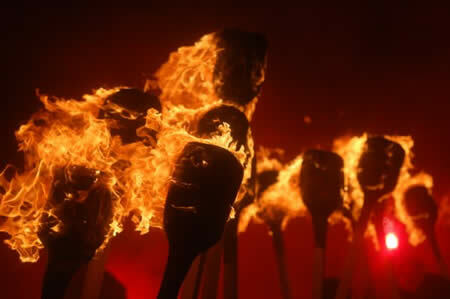 Mr. Foxwell came forth and related how he had passed a night at sea in a small shallop, hugging the shore but afraid to land; suddenly at midnight a loud voice called him, “Foxwell, Foxwell, come ashore,” and upon the beach he beheld a great fire ringed by dancing men and women. After an hour they vanished, and next morning Foxwell put ashore and found their footprints and brands’ ends on the sand. But no living Englishman or Indian could he find on shore or in the woods. The passage is odd in itself, to be sure, and although logical reasons might be found to explain it, they are no fun at all. I reject them soundly. I love the fairy-like creepiness of it, and think it’s a good thing Mr. Foxwell was too timid to put ashore. The story really sets my imagination to quivering. The father of Aemilianus the orator, to whom some of you have listened, was Epitherses, who lived in our town and was my teacher in grammar. He said that once upon a time in making a voyage to Italy he embarked on a ship carrying freight and many passengers. It was already evening when, near the Echinades Islands, the wind dropped, and the ship drifted near Paxi. Almost everybody was awake, and a good many had not finished their after-dinner wine. Suddenly from the island of Paxi was heard the voice of someone loudly calling Thamus, so that all were amazed. Thamus was an Egyptian pilot, not known by name even to many on board. Twice he was called and made no reply, but the third time he answered; and the caller, raising his voice, said, ‘When you come opposite to Palodes, announce that Great Pan is dead.’ On hearing this, all, said Epitherses, were astounded and reasoned among themselves whether it were better to carry out the order or to refuse to meddle and let the matter go. Under the circumstances Thamus made up his mind that if there should be a breeze, he would sail past and keep quiet, but with no wind and a smooth sea about the place he would announce what he had heard. So, when he came opposite Palodes, and there was neither wind nor wave, Thamus from the stern, looking toward the land, said the words as he had heard them: ‘Great Pan is dead.’ Even before he had finished there was a great cry of lamentation, not of one person, but of many, mingled with exclamations of amazement. The sea holds many mysteries and dangers, but let’s not forget that strange shores do as well. You can find the rest of this Loeb Classics Library translation of Plutarch here. You are currently browsing the archives for the fairies	category. WordPress 5.1.1 and delivered to you in 0.920 seconds using 40 queries.